Impressive Ancient Egyptian Home Decor! Impressive Ancient Egyptian Sculptures, Coffee Tables and Life Size Egyptian Statues! Are you looking for the most exotic and unique Egyptian home decor? You are in for a very ‘ancient Egyptian’ treat then! Transform your home into an exotic Egyptian getaway by adding the most unique and amazing Egyptian sculptures, coffee tables and life-sized statues! 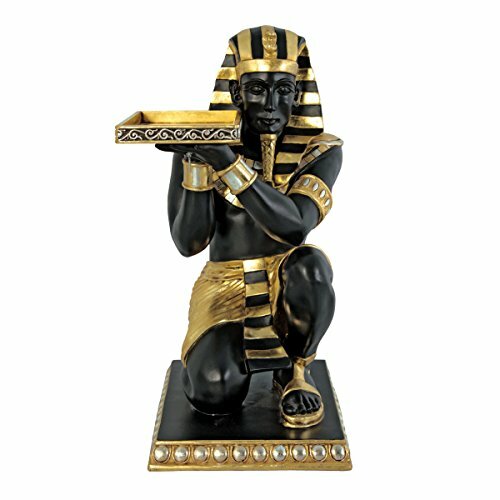 I am a huge fan of Egyptian decor and on this page you are going to find the most exotic Egyptian statues being sold! From life-size Egyptian sculptures to gorgeous Egyptian lamps, sculpture tables and ancient Egyptian animal statues! I was mesmerized by these fabulous ancient sculptures! Take your time and play some ancient Egyptian music too while your browse through here! *This is a magnificent life size Egyptian God Ibis Thoth sculpture! He is very impressive and also stands over 6 feet tall! When we talk about ancient Egyptian sculptures and decor, the first thing that comes to our mind is the Sphinx! Now you can have one in your home! She has the body of a lion and the face of a human! Sphinx sculptures were create to protect the people! This amazing life-size ancient Egyptian Sphinx statue will make your living-room look like a gorgeous Egyptian palace! One of the most impressive life-size Egyptian sculptures for sale! Amazing Life-size Classic Egyptian Anubis Statue! Are you looking for the best life size Egyptian sculptures for sale? You are going to be very impressed with this magnificent Anubis sculpture! This is an impressive life-size Anubis statue for sale! He is over 8 feet tall!! He is also highly detailed, down to all his muscles, clothing and expressive eyes. We can’t talk about Egyptian sculptures and Egyptian statues without also including an Egyptian sarcophagus in the mix! 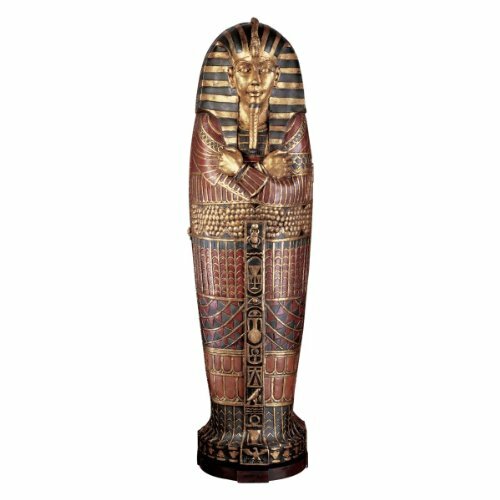 Full-size replica of the sarcophagus of King Tut Tutankhamen! How much more Egyptian can your home get? 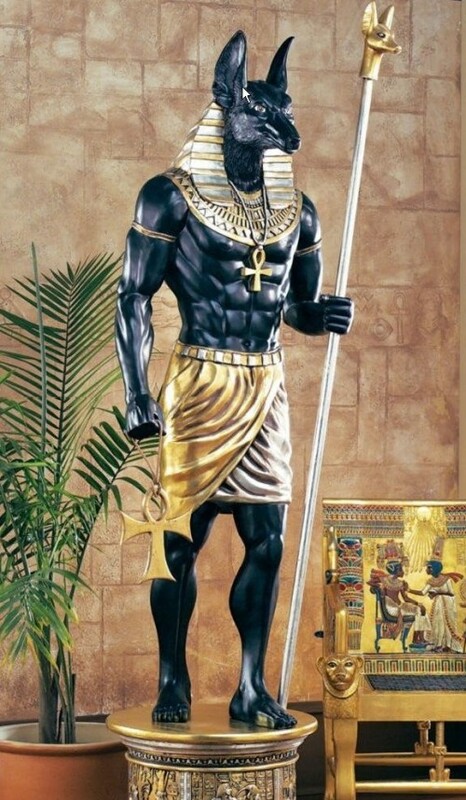 How about a gorgeous and very exotic life-sized ancient Egyptian servant standing statue? It is one of Cleopatra’s maid servants sculpture! Very unique and very realistic! Wonderful piece of Egyptian decor to have! 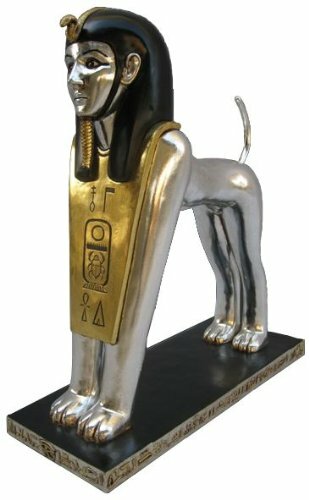 Cool and Unique Sphinx Statue for Sale! 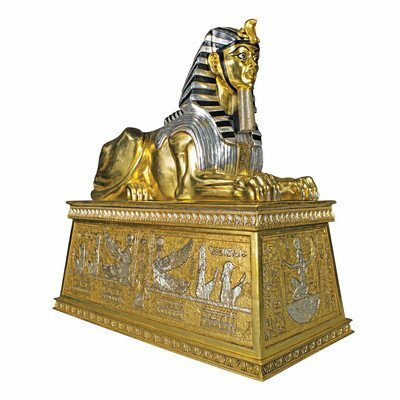 Another beautiful and unique large Egyptian Sphinx statue for your home! I love the combination of silver and gold! 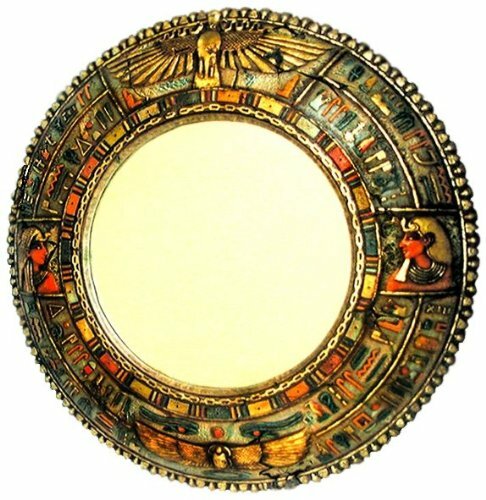 Beautiful Hieroglyph Design Classic Egyptian Collectible Mirror! When I saw this gorgeous Egyptian wall mirror with a beautiful hieroglyph design I went crazy! *Back in the ancient Egyptian times, only the most wealthy and powerful people had access to mirrors! This mirror is also huge, at almost 4-feet in diameter! 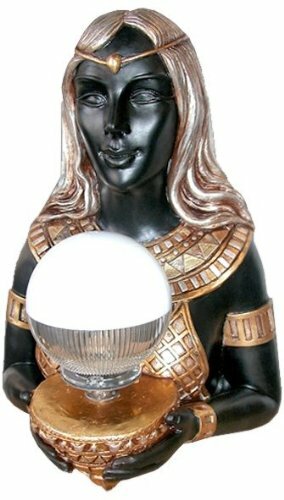 Unique Egyptian Goddess Hathor Sculpture Statue Wall Lamp! What a beautiful and very exotic Egyptian Goddess sculpture wall lamp for sale! Wonderful gift idea to any Egyptian decor lover! Truly stunning and will stand out in the living-room! Stunning Servant to the Pharaoh Glass-Topped Console Table! 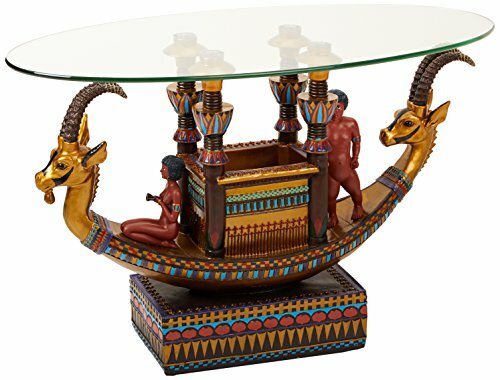 This is a beautiful and highly-detailed Egyptian Pharaoh servant glass-topped console table to have in the living-room! The black and gold color combination is stunning! He is so realistic that at any moment you expect his eyes to open and look straight at you, before getting up and start walking! Perfect piece to complement your Egyptian inspired living-room decor! 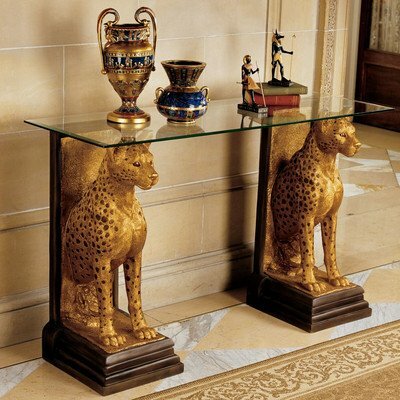 *What an Amazing Royal Egyptian Cheetahs Sculptural Glass Topped Console Table for Sale! Another absolutely stunning Egyptian console table for sale! 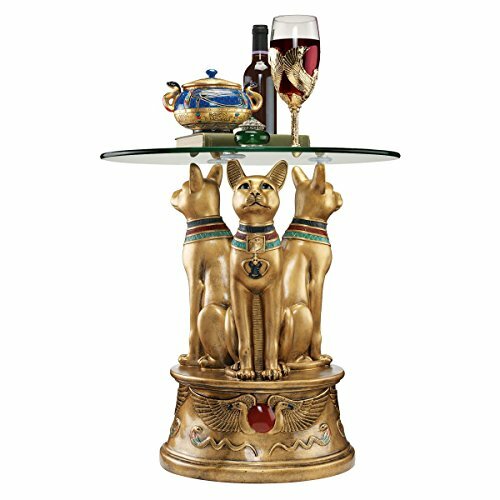 Two golden royal Egyptian cheetahs are holding the glass top! Beautiful Egyptian Theme Home Decor! Another beautiful glass-topped Egyptian sculptural table for sale. Bring the mystery and exotic beauty of the ancient Egyptian Gods and Goddesses to your home with this impressive Egyptian Goddess wall sculpture! She has her eyes closed, beaded hair and open arms with feathered wings! Definitely a great Egyptian piece to have! Cats were sacred animals for the ancient Egyptians and they believed that they were actually the Goddess Bastet, the Goddess of the sun and life! That’s why they usually had statues of Bastet in their homes. I love this metallic silver and gold color combination! 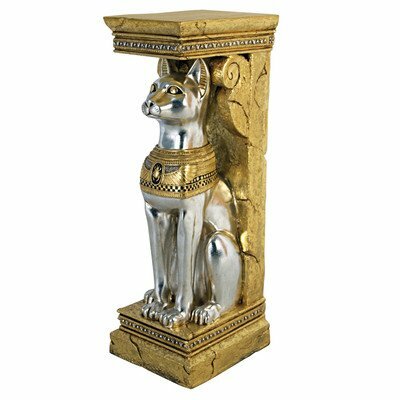 I had to show you this gorgeous hand-painted golden Egyptian Bastet end table for sale! Three gorgeous golden cats hold the glass top! 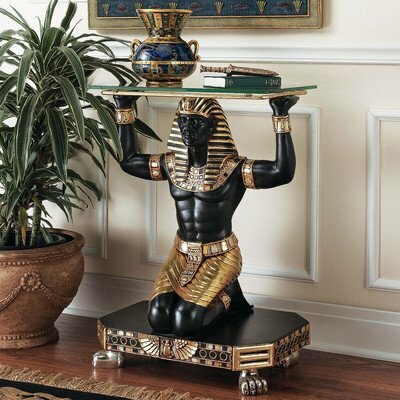 And I will end my selections of Egyptian home decor items with this gorgeous black and gold hand-painted Egyptian Pharaoh kneeling Nubian servant end table for sale! Another stunning Egyptian piece to have in your living-room! You can combine two or three pieces and create a beautiful ancient Egypt inspired ambience! *Let’s travel back in time and history and learn more about ancient Egypt! *Learn about the ancient Egyptian Gods!